If you spend at the computer at least two hours per day, you need to protect your eyesight from the harmful effects, choosing special glasses. How to choose a suitable device? Visit an ophthalmologist and check your eyes. Doctor describe the sensations that occur while working at the computer: there are no feelings of dryness and burning, whether eyes are tired. Be sure to specify at what distance from the eye is the monitor. The doctor will identify whether you have nearsightedness or farsightedness, and based on this will determine what glasses you need: with diopters or without. He will write a prescription which you will be able to go to the optician. To date, global industry offers a huge selection of different glasses for working at the computer. Try to focus not only on design but also on quality. The rim should be sturdy, with quality soldering and securely lenses. It is better not to save on their own health and purchase eyeglasses known firms, as they will last longer. Lenses computer glasses must have a special coating with green, gold or purple highlights. In addition, proper selection of frames will help you to decorate the face, to give it a more strict and focused. Choosing glasses, try them on. They should sit comfortably on the bridge of your nose, without squeezing it. Make sure that the arms don't cause my ears any discomfort, and do the glasses do not fall off when turning the head. Lower your eyes, raise your eyes to the ceiling, look around. 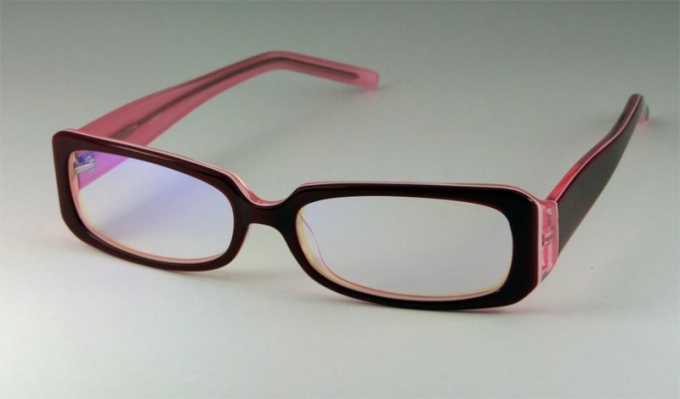 The frame should not interfere with the see through lenses. Find out from the seller whether this product health certificate. Remember that the law of defective points shall be neither exchange nor refund. Why not buy them either in kiosks or in small shops, it is better to turn in a solid company. Place your order and wait for fabrication. Then buy and you can easily use the computer without fearing for your eyesight. Even wearing special glasses, try not to overload the eyes. Frequently look away from the monitor, do a small breaks every hour.